Water Damage can occur in your home or office for a variety of reasons. Excess water in your home can come from natural disasters such as hurricanes or floods, as well as from pipes that burst or start to leak in your plumbing system. Household appliances can malfunction and cause water to pool in areas that might not be noticeable. Keep an eye on your water bill; a sudden increase one month may indicate a leaky pipe or other problem. Also, if you notice any foul odors or black spots (mold) on the walls, contact a water damage restoration company like Able Restoration, Inc immediately. The first thing you should do is contact Able Restoration, Inc. You do not want to delay, since mold begins to form after only a few short hours. The longer water sits, the more opportunity it has to wreak havoc on wood, walls and carpet. You will also want to contact your insurance company to begin the claim process, avoid the affected area whenever possible. If there is standing water in an area with electrical appliances, do not enter the room under any circumstances. Able Restoration, Inc will first inspect the area and attempt to stop the water source from creating additional damage. We will then use our water extraction machinery to remove any standing or access water from the site. Once the water is gone, we start the drying process with dehumidifiers and heavy fans. When the area is dry to our satisfaction, we test the air to make sure the problem is resolved and the moisture and any mold spores have been removed. Mold remediation is the process of removal and/or clean up of mold from an indoor environment, such as a home or a business. If a home or a business has serious mold damage, it is best to Able Restoration, Inc as specialized equipment and methods may be required to remove the mold completely. The mold grows best when there is lots of moisture from a leaky roof, high humidity, or flood. There is no way to get rid of all molds and mold spores from your home. But you can control mold growth by keeping your home dry. The time it takes for the mold removal process depends on many factors such as how much mold is present, where the mold is growing (behind walls, etc. ), and the materials it grows on. Most mold removal (remediation) takes anywhere from 1 day to 5 days. How Do I Know the Removal Worked? There are two different ways to know when mold is removed. Visual: You might see that all mold is gone is away, but hidden mold colonies and mold spores can linger in hidden places and in the air. So visual inspection is not the best way to insure complete removal. Third party testing is usually the best way to test for complete mold removal verification. Able Restoration, Inc will not test as this is a conflict of interest and State Of Florida residents be aware that there is a law that states that a mold removal company must have certain certifications and cannot test at the same time as the remediation. Please also beware that there are different kinds of testers ranging from home inspectors to industrial hygienists. Please ask your independent tester if their tests, in writing, will stand up in court. Remember that you need to have a pre testing procedure (mold spore tests, etc.) , protocols (a list of how to remove the mold), and a clearance test after the mold removal to ensure that the mold spore count is at acceptable levels. How Much will Remodeling Cost? Measure your kitchen’s length and width and multiply for square footage. example: a 10 ft. x 10 ft. kitchen= 100 sqft. Next, multiply the square footage by Able’s averages: budget= $75 per square foot, Average grade= $105 per square foot, and premium= $125 per square foot. This method will give you the average cost of your size of kitchen remodel, including everything except new appliances. For additional questions, Contact Able Builders, Inc Customer Service at (866) 331-3770 option “2” for additional answers. *All numbers are an approximation until a final scope of work is approved by both parties. What Type of Materials Should I Choose? Your project manager will help you choose the best quality materials to fit your job budget. As a local distributor for many building materials, Able Builders, Inc can frequently accommodate virtually any budget for kitchens, baths, and floors. 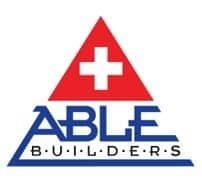 Able Builders, Inc has a showroom at 2071 Range Road in Clearwater, Florida that maintains a broad selection of kitchen and vanity cabinets, counter top samples, trims, crown moldings, and wood, laminate, & vinyl flooring products. We also have numerous catalogs and design concepts. The showroom is available by appointment, so call us today at 727-447-5868 to schedule a visit. The time it takes to complete a project depends on its size and scope; at Able Builders, Inc once your project starts, we strive to work 8 hours a day every day, Mon-Fri, until finished. You will receive a job schedule prior to your start date, but most jobs are competed within one to two weeks on the average. Who Can I Call About Financing? Contact Justin at: 727-447-5868, extension 101 or customer service to be transferred.